This article was originally published by the Herald Sun. See it here. In 2003, Durham Central Park was a five-acre area full of bramble bushes, weeds and trash. On the east side of Foster Street, South Ellerbe Creek ran through the park but was so overgrown with kudzu and bushes you couldn’t even see it. The area which is now the DCP Pavilion, home of the Durham Farmer’s Market and many other events throughout the year, was a wasteland that needed lots of love. The only part of the park that had been developed was the Grace Garden in the northwest corner of the park. The rest of the five acres was pretty much a mess. That same year Dan Jewel, a new DCP board member and local landscape architect, knew that with very little money to spare in the DCP bank account, we needed some volunteer help with some serious clean-up duties. 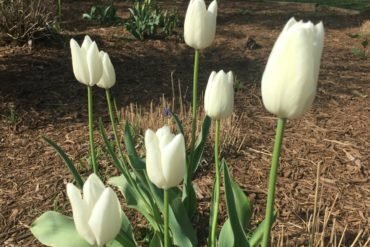 And besides, the DCP’s vision of the park was that of a community park – “Durham’s own big back yard” – so the idea of getting the larger community involved to help clean it up and get things rolling was a great idea waiting to happen. About that same time, Mary Brown, a leader of the Immaculate Conception Youth Group, was looking for a service project for her middle school and high school age kids. She was looking for an outside group activity that could help the community but also give the kids a chance to work together and get to know each other better outside the church environment. So when Mary saw the plea for help that Dan put in the newspaper for some volunteer help at the Durham Central Park, she contacted him and the rest is history. For each of the past 10 years, the Immaculate Conception Youth Group has taken part in at least two volunteer workdays each spring and fall. Working at DCP four times every year is one of the highlights of the youth group’s yearly activities. Several families have had one or more kids working on DCP projects for all of the past 10 years. They consider DCP “their” park…and that it is! To her surprise, three hours later the creek appeared and most of the overgrown invasives were gone! A true miracle! Other memories include seeing true friendships grow during the workdays at the park between awkward young folks who blossom when they are outside with work to do together. Jewell, who initiated the relationship between Immaculate Conception and Durham Central Park, is still a DCP board member and he still organizes the Volunteer Workdays that typically happen the first Saturday morning between March and November from 9 a.m. to noon (check the www.DurhamCentralPark.org website for details). On the morning of March 2, DCP dedicated a picnic table and plaque to Immaculate Conception. 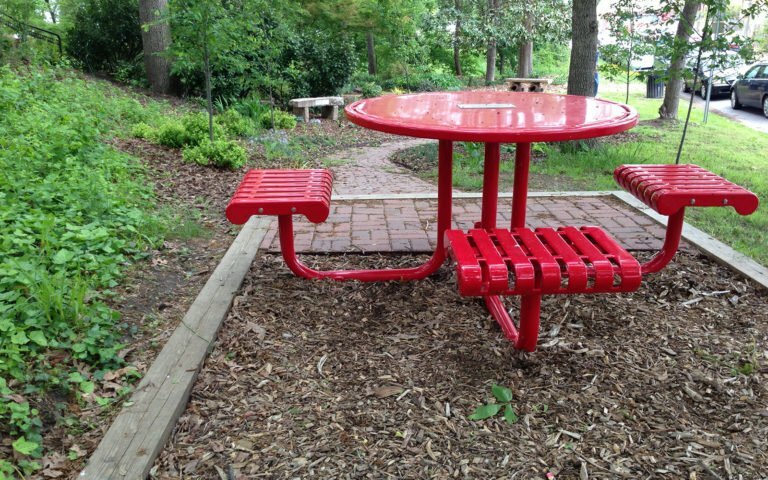 It’s the round, red picnic table at the end of the walkway between the Grace Garden and our new beautiful railings that lead to the parking lot on Washington Street. It is a small token of our appreciation for their consistent hard work at the park over the past 10 years. It is relationships like the one between DCP and the Immaculate Conception Youth Group that make Durham such a wonderful place to live and make DCP a special place to visit…it really is a community park and Durham’s ‘big back yard’! Come join the fun and help out at the park for one of our monthly DCP Volunteer Workdays. We welcome individuals or groups who want to help make our park the best in Durham. We are also looking for groups to adopt a few sections of the park to keep tidy and develop into even more beautiful gardens. Come be part of the team at DCP!